In the race to construct America’s first subway, Boston ultimately prevailed over rival New York City. But as a new book shows, there would be tragedy before triumph. 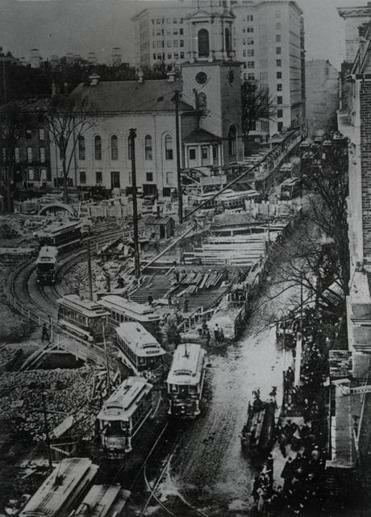 Boston broke ground on its subway in 1895, with workers digging the trench in sections. Horse-drawn carts carried away the dirt and rocks. Adapted from The Race Underground by Doug Most. Copyright © 2014 by the author and reprinted by permission of St. Martin’s Press LLC. THE WORKERS WORE baggy pants, suspenders, long-sleeve shirts with the sleeves rolled up their forearms, and hats to protect their hair and eyes from flying dirt and rocks. They started at the corner of Boylston and Tremont and made their way toward Charles Street. The carts with their big wooden wheels were slowly pulled out of the hole by horses and replaced by empty carts, which were quickly filled and pulled away just the same. It was tedious, but in the course of a nine- or 10-hour day, with more than three dozen men applying their muscle nonstop except for a 30-minute lunch break, progress was fast. The London Underground tunnels were typically between 100 and 200 feet down, but the Boston tunnels would be no more than 50 feet. There were three reasons for this. A shallower trench could be dug faster and would produce less dirt to cart away. The likelihood of damaging neighboring buildings was greatly reduced if the tunnel were closer to the surface. And a shallower subway meant fewer stairs for passengers to walk up and down to get into and out of the stations. The trench was dug in sections, 10 feet long by 12 feet wide and 6 feet deep. Wooden braces were fixed against the dirt walls to prevent a cave-in and placed across the top of the trench to provide the foundation for bricks to be laid. As the trench got deeper, steel support beams were laid along the sides of the walls and along the top, perpendicular to the tracks. The deeper the workers went, the greater the risk. They were digging around water pipes, gas pipes, and sewer lines, and a leak from any of them could prove disastrous. When Thomas Roy and Michael Grogan emerged from the trench near the entrance to the Common on Charles Street one morning, they both had a dizzy look about them as they explained to their boss why they could no longer work. The city managed to keep its busiest thoroughfares open to traffic. Rather than eliminate street-level rail service, engineers took the extraordinary step of designing a detour of the tracks. “The gas has knocked me out,” Roy said. “My eyes are so blurred that I cannot see anything with them.” His partner added, “Mine feel as if I had been peeling onions all the morning.” Both men left for the hospital to be checked out, never to return to the job. On April 19, 1895, the day arrived that anyone who had followed the subway debate knew was coming. The living and the dead came face to face. Dr. Samuel Green, a former mayor of Boston and one of the city’s most distinguished physicians, arrived at Park Street early in the morning. The workers stood by, holding their shovels and picks, as the 65-year-old bent down to pick up some tiny fragments from the ground that looked like small rocks or twigs. But Green knew precisely where he was standing and what he was holding. The workers had dug up pieces from a skeleton. There would be no more digging on this day. Green knew the discovery of human remains would stoke the fears people had about going underground to ride a train. During the long debate in Boston about whether to build a subway, one skeptic, after visiting London, said the subway gave him a “buried alive” feeling. Yet another asked officials if they had any desire to go underground before it was their time; he certainly did not. Green didn’t know what else he could do to reassure people. But he also knew this was only the beginning. Day after day, workers carted away new piles of remains. By the summer, more than 900 fragments had been removed and reburied. Additionally, the Public Garden had been built upon a salt marsh of fibrous peat, which, when uncovered, gave off an eye-watering rotten-egg smell. The only solution was to raise the grade with additional soil and then to make sure it was no longer used as an unofficial city dump. It was estimated that 9,000 cubic yards of fill were needed for the Public Garden, and 62,000 cubic yards for the Common. A plan was drawn up that called for plowing portions of the parks, putting down the new dirt to create an undulating surface, planting grass seed, and inviting lawn bowling, lacrosse, and other games onto the grounds. In the end, the new surface in the two parks was in some places a full 6 feet higher than the old, and new paths totaling 3,500 square feet were created. By May 1895, 130 elm trees that were in the subway’s path had been replanted, with 40 of them bordering the sidewalk of the Public Garden. During construction, the city managed to keep its busiest thoroughfares open to traffic and to close them only after 11:30 at night. 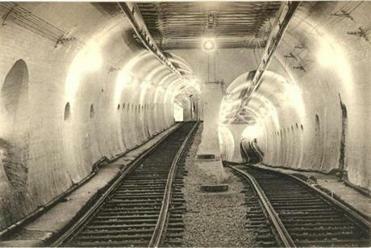 Rather than eliminate street-level rail service for more than two years, engineers took the extraordinary step of designing a detour of the tracks, which was constantly shifted to accommodate the tunnel work. On May 21, the site was a bustle of activity. An enormous pile driver was slamming its hammer into the ground with a great loud thud to loosen the dirt for the workers, who quickly shoveled it into the carts and waited for the next drop. A stout iron chain kept back onlookers fascinated by the powerful 2,300-pound driver, and every time it slammed down with a whack, whack, whack, a collective “ohhhh” shot up from the crowd. David Keefe, a young worker from Charlestown, was shoveling out dirt that had been loosened by the pile driver when he leaned too far forward. Before he could react, the wicked blow from the swinging hammer grazed his forehead and arm and knocked him to the ground unconscious. Miraculously, the hammer had only stunned Keefe. He regained consciousness quickly and was taken to the hospital to have his gash dressed and broken arm tended. It was the first serious accident on the construction site. As work continued for the next two years, it would not be the last. On March 4, 1897, the sparks from an above-ground streetcar and an undetected gas leak combined to create a horrific explosion. Ten people were killed. WHEN A POLICE OFFICER, Michael Whalen, first detected the smell of gas on the morning of March 4, 1897, he didn’t panic. He knew the odor had snaked its way through the neighborhood for months. He knew apartment dwellers were being forced from their homes because the smell would get so bad. But each time a gas leak was reported, within a few hours the smell would fade and all would be forgotten, until the next time and the calls started anew. On this morning, though, the odor didn’t go away. It kept getting stronger. At seven minutes after 11, the phone rang at the Boston Gas Light Company, and Nellie Harmon answered. “Will you please send some men to the corner of Tremont and Boylston streets right away?” a man’s panicked voice asked. While the Masonic Temple at that corner was being evacuated, gas continued to pool a block away, just below the surface of the street and directly over workers putting the finishing touches on the subway. The tunnel was complete, and the focus had shifted to making sure the thousands of sewer, water, and gas pipes underground were rerouted, connected, and sealed and that the roof and floor of the tunnel were secure enough to begin piecing the streets back together again. Shortly before noon, three crowded streetcars rounded the corner at Boylston and Tremont. The one with the Mount Auburn sign caught the attention of Whalen. As it screeched into the curve, he looked down at its wheels and saw them grinding on the sand scattered over the rails, causing sparks to fly off the side. Onboard, the passengers nearly gagged from the smell of gas, and some turned their heads in search of a breath of fresh air. Then, with no warning, the ground shook and a sound like a cannon boomed. The explosion was so powerful that the clock in the tower of the Young Men’s Christian Union building recorded the precise moment, stopping at 11:47. The streetcars that were rounding the corner soared into the air in a burst of flames, splintering into pieces. The Mount Auburn car came crashing down on its side, directly on top of its horses. The second it hit the ground, the streetcar burst into flames, sending a bright orange plume at least 50 feet into the air. The explosion caused the Hotel Pelham’s windows to break and rain down shards of glass on the sidewalk. A barber on the hotel’s second floor was in the midst of giving a trim when he was thrown across the room. Paul Klein, the owner of a first-floor drugstore nearby, was sitting at his desk sifting through bills. His two giant plate-glass windows came crashing in, taking down bottles, jars, vases, and other supplies. Klein suffered only a few deep cuts in his head from flying glass. But one man standing just outside the drugstore, his hat blown clear inside, was killed. Within minutes at least 150 police and fire officers, along with hospital workers, were on the scene. Their first challenge was keeping back the crowd of more than a thousand witnesses, including many who wanted to rush to the aid of neighbors and shopkeepers. The police finally warned the onlookers that another explosion was imminent. It was a lie. 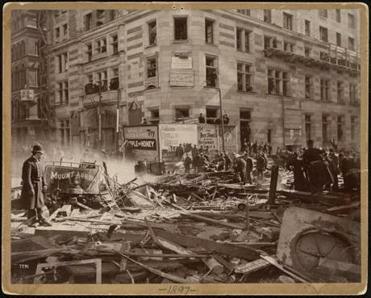 But the crowd scurried back and allowed the rescue crews to work more freely amid the debris. As the rescuers began finding bodies, there was relief that there had not been more fatalities; in all, 10 were killed. Both Mayor Josiah Quincy and Nathan Matthews, an ex-mayor, visited the site to comfort the injured and the workers. Meanwhile, employees from Boston Gas Light Company and the Edison Electric Company wasted no time in setting to work to repair the damage. They found a fractured pipe that seemed certain to have played a part in the accident. Howard Carson, the chief engineer of the subway, was concerned not with what caused the explosion but with how badly it had damaged his tunnel. He wasted no time touring the tunnel, and at an emergency meeting of the Boston Transit Commission held just a few hours after the accident, he assured the commissioners that it appeared secure. Because the explosion occurred between the roof of the tunnel and the surface of the street, he explained, the inside of the tunnel was not damaged. Carson hoped his words would have a calming effect. 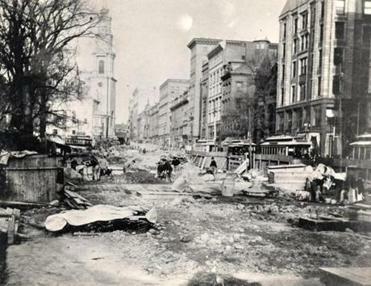 He knew how apprehensive the citizens of Boston had been about a subway, and he assumed the newspaper coverage of the explosion would only reignite their strongest fears that it could never be entirely safe, not when they would be traveling along the same ground where gas lines were buried. All he could do was push his contractors to keep working and hope that in six months, when the subway was expected to open, the accident would be long forgotten. 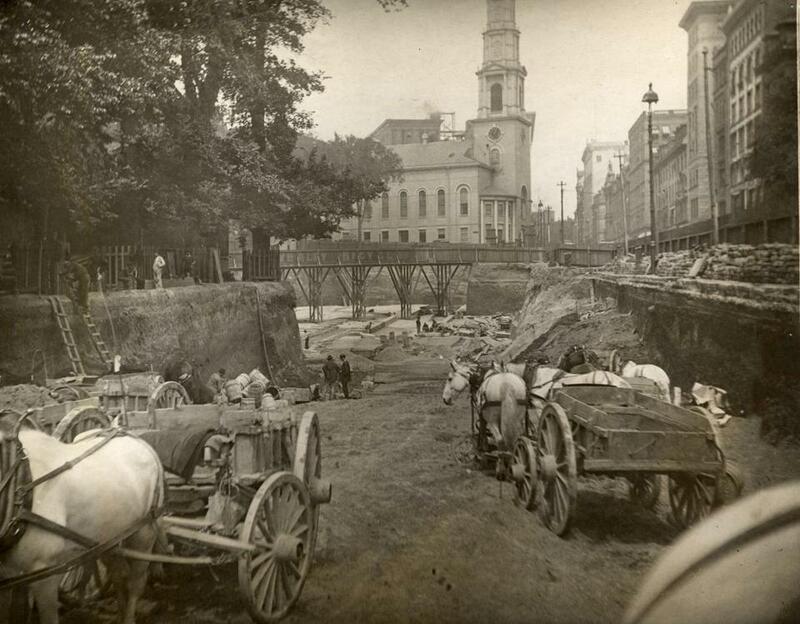 To raise the grade of the Public Garden and the Common to accommodate the subway, an estimated 9,000 cubic yards of fill were needed for the former and 62,000 cubic yards for the latter. WHENEVER ONE OF THE many engineering marvels of the second half of the 19th century was completed, it would be accompanied by orchestrated celebrations. On January 9, 1863, the night London opened its Underground, a banquet at the Farringdon Street Station was held to toast the feat. On May 10, 1869, when the last hammer swung to finish the transcontinental railroad, thousands gathered in the flatlands of Promontory, Utah, to watch as a gold spike was hammered into the ground. But on September 1, 1897, a historic morning for Boston and the country, there would be no boastful proclamations and no celebratory spikes. If there was a practical reason why the subway’s opening did not generate much excitement outside Boston, besides the city’s own Puritan unwillingness to celebrate, it might have been that the actual first leg of the subway was so short. Of the 11 sections being built, only three were ready to be unveiled. The rest, connecting past Park Street out to Haymarket Square in one direction and from Boylston Street away from the Common in the other, were not far behind. Each car would have a motorman and a conductor, one to drive, the other to collect tickets from the passengers. James Reed, or Jimmy, as he was usually known, short and muscular with a thick mustache and weathered face from nearly 30 years of railway driving, and Gilman “Gil” Trufant, one of the oldest conductors in Boston, were two of the most experienced transit men in the city. It was decided that their Pearl Street-Allston car should be the first through the tunnel. When Reed walked into the Allston shed that morning, he greeted his passengers and confessed that he was tired after a night of restless sleep. Dreams of his trolley rushing to reach the subway tunnel first and on time kept him awake, he said. After one final inspection to make sure the car was ready, the doors to the garage opened and the passengers let go a hearty cheer as the Allston trolley set out on its way. The nine rows of benches were not filled yet, but they would be soon enough. Outside, a small group of onlookers waved handkerchiefs and shouted words of encouragement at the popular motorman. “Get there, Jim, old man, and don’t let any of ’em get ahead of you,” one cry went out. Reed smiled. But he turned serious as his car rounded a bend, and he braked to a stop to allow another dozen passengers on board. “All aboard for the subway and Park Street,” he shouted with confidence. As the car got closer to Boston, the crowds along the street grew in numbers, with men, women, and children waiting and waving their hands high. Bouquets that Reed and Trufant had been handed were visible in front, but they were being crushed more and more with each stop. The car by now was brimming over, with passengers standing on the footboard and dangling off the side, limbs visible out of the windows. A car with seats for 45 passengers and standing room for a few dozen more had 140 passengers. With Reed at the controls, the Public Garden on his left, and the clock on the Arlington Street Church pointing to 6, car No. 1752 crept to the summit of the subway tunnel’s downward slope. If there was a time to stop and acknowledge the moment, this was it. Not only was the subway completed on time, in 2½ years, it came in at $4.2 million, under the $5 million projected cost. 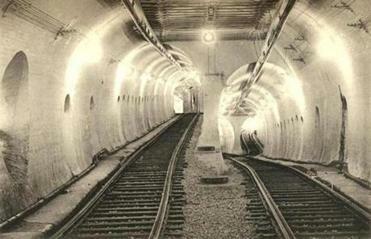 It had been 10 years since two men, Henry Whitney in Boston and Abram Hewitt in New York, first made serious overtures about tunneling beneath their cities. A decade later, one of those cities stood at the brink of history while the other had yet to put a shovel into the ground. For Boston, that was satisfaction enough. It was bright enough to read underground. The air was clean enough to take in one long deep breath and not notice any difference from aboveground. And when Reed guided his trolley underground and on to the station, any lingering fears were quashed for good. There were no screams of fear or groans of disgust or complaints of rank odors. It was bright enough to read underground, with the light from the white bulbs bouncing off the white-enameled brick walls and combining with the sunlight that peeked down through the staircases and in through the overhead vents to make it feel like noon on a sunny day. The air was clean enough to take in one long deep breath and not notice any difference from aboveground. Reed was thankful to see only a few people waiting for him at the Boylston Street Station, and they agreed to board the next car. He pulled away, cheers filling the tunnel, and at 6:06 a.m., No. 1752 arrived at the Park Street Station, its first voyage complete. More than 300 were standing and waiting, hats waving in the air. “Bravo, bravo,” the cries rang out. “Bravissimo,” a group of Italians hooted. But when another man hollered, “Three cheers for the subway!” in an attempt to start a hip-hip-hooray chant, he found himself shouting all by himself, the crowd too distracted to join him. But before he could inquire, the rumbling of a car was heard and then a second and a third, and all three came into the station at the same time, discharged their loads, and carried off the next crowd. Relieved, Allen decided to join them. “I think Boston is going to like it and like it a great deal,” he said, smiling, as he stepped onboard. And with that he vanished into the darkness of America’s first subway tunnel. Doug Most, the Globe’s deputy managing editor for features, will discussThe Race Undergroundon February 4 at the Boston Public Library and on February 18 at Brookline Booksmith. E-mail him at doug.most@globe.com.